Cooks and Curds Cheese Gala: First sitting sold out! One look at that menu and small wonder the first sitting has quickly sold out! 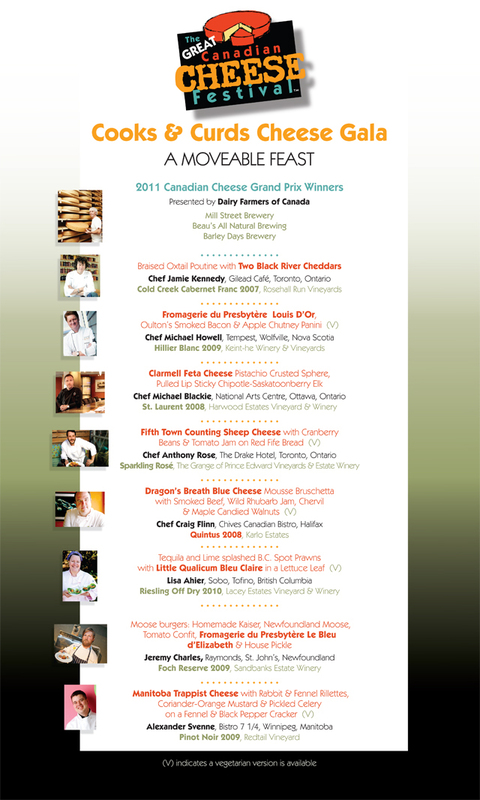 With such an array of outstanding chefs and fascinating dishes, who wouldn’t want to be at the Cooks & Curds Cheese Gala at The Great Canadian Cheese Festival this Saturday evening? It’s a strolling tasting dinner, not a sit-down affair. Dress up rather than down. Admission for one adult to a gastronomic gala pairing chefs with cheesemakers, wineries and craft brewers to create extraordinary tasting dishes for a rapt audience of cheese enthusiasts and foodies. Eight chefs, eight tasting dishes, eight cheeses, eight wines, eight beers. Eight stations on risers around Crystal Palace. Groaning board of Canadian artisanal, farmstead and specialty cheese, featuring winners in the 2011 Canadian Cheese Grand Prix. Followed by sweet delights, port, ice wine and coffee. Age of majority event. Free parking. HST included in admission price of $95. No fee charged for online ticket purchase. What a line-up of exhibitors for Great Canadian Cheese Festival on Sunday! More than 100 artisan cheeses will be available for tasting—and purchase—this Sunday at The Great Canadian Cheese Festival. Admission for one adult to the Artisan Cheese & Fine Food Fair on Sunday, June 5, at Crystal Palace in Picton, Ontartio, is $30 when purchased in advance online or by calling 1.866.865.2628. Adult admission includes free parking, 10 tasting tickets, a Festival cooler bag for cheese purchases, a Festival wine glass for sampling wine and beer, access to all vendors and exhibitors, a tasting seminar featuring winners of the 2011 Canadian Cheese Grand Prix. Rush seating for the tasting. HST included in admission price. No fee charged for online or telephone ticket purchase. Regular price $40. Admission for one youth aged 14 to 18 years includes 10 cheese-tasting tickets, a special presentation on cheese-tasting and cheesemaking for kids, a tasting seminar featuring winners of the 2011 Canadian Cheese Grand Prix. Rush seating for the tasting. HST included in admission price of $15. No fee charged for online or telephone ticket purchase. Admission for one child aged 13 years and younger includes 5 cheese-tasting tickets, a special presentation on cheese-tasting and cheesemaking for kids, a tasting seminar featuring winners of the 2011 Canadian Cheese Grand Prix. Rush seating for the tasting. HST included in admission price of $5. No fee charged for online or telephone ticket purchase. Julia Rogers is a cheese professional, wine educator and event animator—recently a guest judge on Top Chef Canada—and one of the featured tasting seminar presenters at The Great Canadian Cheese Festival. Her extensive knowledge of food and food lore has been formed by studying, teaching and traveling. She is passionate about cheese and dedicated to sharing her discoveries with others. Years of tasting, encounters with cheesemakers, and diverse retail, catering and consulting experience have given her a thorough understanding of cheese history, flavours, and production. Julia trains sommeliers and hospitality students in cheese appreciation, and teaches for the internationally recognized Wine and Spirit Education Guild. Her articles appear in Food and Drink, Slow Food Canada and Wine Express, and in her newsletter, The Wedge Issue, accessible via her website, www.cheeseculture.ca. Among other regular Toronto engagements, she hosts Night School for Cheese Fans at the Leslieville Cheese Market, which was recently voted “Best Cheese Appreciation Class in Toronto” by Toronto Life Magazine. In April, she was guest judge on Top Chef Canada when an episode of the Food Network Canada program featured Canadian cheese. A primer for those who want to appreciate cheese, not just eat it. Get acquainted with the different families and flavours of cheese. Gain insights into pairing cheese with beverages and other accompaniments. Learn to taste and talk about cheese like a pro, as you enjoy a flight of 6 to 9 selections. Québec is the creative leader of our Canadian cheese renaissance. No region comes close to producing the range of styles and flavours that originate in la Belle Province. Enjoy a whirlwind tour of icon cheeses and newer artisan offerings from our trend-setting neighbours to the East. Cole Snell will be on hand-pulling fresh Ontario Buffalo Mozzarella. Jameson Irish Whiskey will be pouring shots to be taken with cheese chasers for the Name That Shot contest and the cheesemakers of Quebec are sending five award-winning cheeses for you to taste, thanks to Plaisirs Gourmets. Including Alfred Lefermier, Tomme de Gross-Ile and Rassembleu. 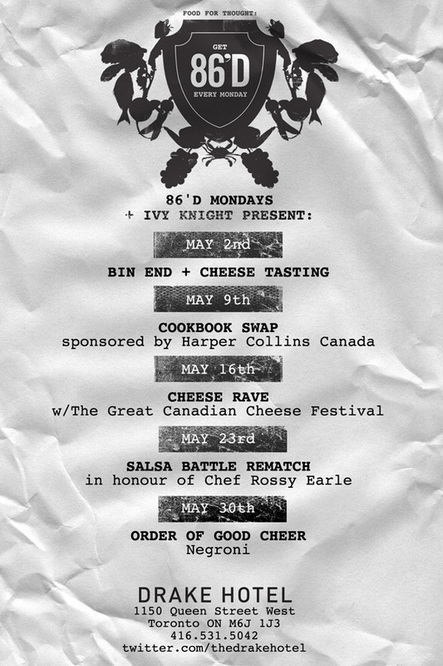 From 7 p.m. to 10:00 only, Cheese Festival tickets will be sold on the spot for unbelievable prices ranging from $86 to $8.60 to commemorate the 86’d festivities organized at the Drake every Monday night by Ivy. 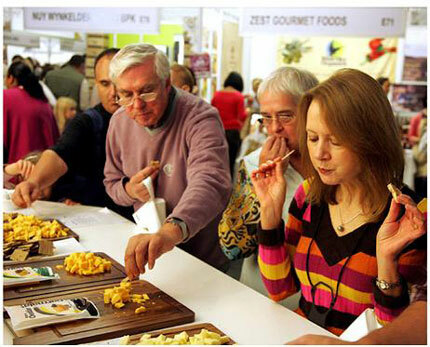 Click here to read what the Ottawa Citizen has to say about at The Great Canadian Cheese Festival taking place June 4-5 at Crystal Palace in Picton, in the heart of Prince Edward County, Ontario’s fastest-growing culinary destination and Canada’s newest VQA wine region. 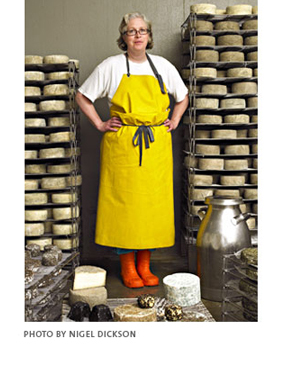 Ruth Klahsen in a classic cheesemaker portrait photographed by Nigel Dixon for Toronto Life. The real story is that Ruth is a graduate of the inaugural class of ’83 at the Stratford Chefs School where she also teaches cheesemaking. Her cuisine is well-known to patrons of premier restaurants Rundles and the Old Prune in Stratford, Ontario. For 11 years, from 1990 to 2001, Ruth was the Chef and Manager of the Green Room of the Stratford Shakespeare Festival responsible not only for the entire smooth functioning of the kitchen but also the special on-site catering. When she walks into the Festival today, she still gets hugs from Festival staff and actors. She’s the one who bolstered their bodies and souls with truffles and caviar and anything their hearts desired . . . sometimes on the sly. While at the Festival, Ruth dreamed of being a cheesemaker and made her own chèvre. But managing a big operation took its toll and when budget restrictions conflicted with Ruth’s strong principles, she threw in her apron and apprenticed at a local sheep milk dairy. By 2004, Ruth and a partner opened Monforte Dairy (refinancing her house for the start up money) and started making sheep-milk cheeses in a rented facility in Millbank, Ontario, just north of Stratford. The partnership dissolved early on but Ruth continued making cheese and Monforte soon became known as southwestern Ontario’s premier artisanal cheese company. Ruth, clad in her vintage apron, sold her signature Toscano and other cheeses at numerous markets in the GTA, quickly gaining fans and followers among foodies, chefs and people who like cheese and remembered when almost every small town in Ontario had a dairy. Monforte doubled sales every year. Known for its range of extraordinary cheeses, Monforte has become supplier of choice to five-star restaurants, leading wineries and progressive food retailers throughout Ontario. In the fall of 2009, Ruth was invited to the State dinner for Prince Charles and Camilla at Rideau Hall where her cheese was featured on the menu. Not one to follow the well-worn path and no fan of bureaucracy and procedure, Ruth made the tough decision in January 2009 to pull out of the facility where she was making Monforte cheese, striking out on her own to realize her dream of creating a permanent home for Monforte. Monforte Renaissance 2010, a revolutionary microfinancing campaign through Community Shared Agriculture (CSA), was conceived to raise the capital to build Monforte’s new dairy. CSAs were offered at three different levels—$250, $500 and $1000—paying out in cheese over five years. Close to $400,000 was raised from her loyal customer base—people who both love Monforte cheese and want to add their support to microproduction, sustainable farming and just food. Ruth has always said the farmers from whom she buys milk have to earn enough to afford piano lessons for their kids. And the dairy got built. And the party thanking the subscribers and community is now the stuff of legend. Located at 39 Griffith Road in the heart of an industrial park in Stratford, the dairy has a store front and garden and the sexiest, blingiest, edgiest paint job around thanks to installation artist Corinne Carlson and the graffiti artists at The Loft in Toronto. Monforte has added cow’s milk cheese to the repertoire of sheep and goat cheese, crackers and charcuterie from the pigs fed Monforte whey. Faced with financial “pinch” in January 2010, Ruth once again appealed to her supporters for help. Within a week her supporters came through with a loan of $100,000. Ruth Klahsen will be a featured seminar presenter at The Great Canadian Cheese Festival taking place June 4-5 at Crystal Palace in Picton, in the heart of Prince Edward County, Ontario’s fastest-growing culinary destination and Canada’s newest VQA wine region. Ruth will define and defend genuine artisan cheese, and discuss why integrity of ingredients matter, why turning milk into cheese is a craft, why the bond between and farmer is important‑and worth preserving. She’ll tackle the MMI issue and offer selection of her artisan cheeses for tasting. Click here for the complete seminar program at the Festival. Maureen Argon, a widely published writer, was fortunate to work as the “shepherdess” at Monforte Dairy keeping the community in know during Monforte’s Renaissance year. Maureen now is the Chairman of Chairman Mo Media, a digital consultancy where she helps business people use social media to spread their message. The video was shot during a media event at Fifth Town Artisan Cheese for the upcoming Great Canadian Cheese Festival by Crowe Productions. As you can see in the clip, it was a mighty breezy day in Prince Edward County which did not deter representatives of Quinte region media outlets from sampling artisan cheeses from Fromagerie du Presbytere, 110-year-old Black River Cheese and Fifth Town Artisan Cheese, wine from Harwood Estates Vineyards & Winery, beer from Barley Days Brewery and an amazing dish prepared by Chef Andreas Feller of Blumen Garden Bistro using Fifth Town cheese. Mayor Peter Mertens of Prince Edward County welcomed the Festival to the County. Festival director Georgs Kolesnikovs praised the Invest in Cheese initiative for opening his eyes to the rich history of cheese in Eastern Ontario and leading him to base the Festival in the County, specifically at historic Crystal Palace in Picton. For detailed information about the Festival and ordering tickets online, visit CheeseFestival.ca.